Irish Actor best known for playing James Bond in Goldeneye, Die Another Day and for roles in films such as The Thomas Crown Affair, Mamma Mia!, Mrs. Doubtfire, Dantes Peak and The Matador. He has claimed "195lbs, 6ft 2 on a good day." and in his Spotlight casting directory page in the 1980's, gave Height 6 feet 1 inch. Nah, “tall, dark and handsome” was the trademark. Anywhere from 6ft1 to 6ft3 is ideal. Before Craig, they all ticked that box. He’s meant to be taller than most but still able to blend in and obviously be put in siuations where he’s outsized and has to use brains rather than brawn. If a 6ft4-5 guy played Bond it would start to look ridiculous. For instance Liam Neeson would have been an awful Bond. But at the same time he’s meant to have a certain presence physically...that’s why Connery was brilliant. For a character like Bond average height would make far more sense than above average. Bond isn't supposed to be a physical brute, he's a spy. His specialty is blending in, his combat ability is primarily in firearms and even when he does fight hand to hand he relies on skill rather than strength. I think the original character in the novels is trained in Judo. I'm pretty sure in the novels he was described as average in looks and stature too. An ordinary man caught up in extraordinary situations. Bond was described as 6 foot in the books and the average male height in the 50's was 5'8". So Bond was the equivalent of a 6'1" -6'2" guy today. Nothing to do with average at all. Master tactician/hand to hand specialist what you smoking man? Bond is a male power fantasy haha. Alot of the actors were 6'1" or near 6'2" who played him in film, Daniel craig was certainly the shortest and with modern height standards a guy who is indeed plain average. He looked 6'1" in the Bond movies and about 6'0" in the Foreigner with Jackie Chan. 6'1" sounds right for Pierce, he apparently reached his full height at 11 years old, he's barely 6 foot today. Pierce was barely taller than a 68 year old Roger Moore so I doubt he was more than Rob lists him. I mean if he was listed 6'1" early then it's doubtful he was much, if any, taller. Connery gawky Lol??? Not even slightly. Nicholas Lyndhurst or Jarvis Cocker maybe. Stallone is 72 now though but I know what you mean! I agree with you Spencer, Pierce currently looks 6'1" as of now. I'd tweak his current height to 6ft0⅞(185.1cm), not convinced he's just 184cm. Has anyone seen his pics with Roger Federer ? I don’t understand he just looks 5’10” in those ? I think it's fair to say that Brosnan may lost a tiny bit more than Firth because he's 8 years older. I agree with Berta that he could still measure around 185cm. I can't see him at just 184cm though. I was walking by daniel naprous table the other day at film con and saw he had a photo beside Pierce - he must have been a henchman for a scene, but I can't remember which Bond...would be interesting to see how Daniel looked with Pierce if there is indeed a scene. @rampage: In the 1st mamma mia 10 yrs ago, I could've sworn Colin edged out pierce then too, it just didn't seem by as much? I was surprised honestly, especially since I didn't actually think firth was that tall. So that confirms firth to be the 6'1" he claims? Just seen mamma Mia here we go again. And was surprised to see now that Colin firth consistently edged out pierce throughout the entire film by a good inch. I think pierce in his prime was a solid 6'1" (6'2" in shoes). So if Colin in 6'1" as he's listed here, is it possible pierce has dropped to a flat 6' these days? 6'2" skellan skarsgard also looked noticeably taller than pierce the entire film..
Brosnan is in the last few years looking under 6ft 1 at times, he may well be 6ft 0.5-0.75 range now. Some guys can reach 60's with minimal loss. But once you hit the 'Sly zone', that 65-70 range, that is when many men will begin to lose more noticeable height. Look more like 6'0 1/2 to 6'0 5/8 with his 6'5 son Dylan Brosnan. In the bond films really didnt look that tall. Maybe because he has such a big head makes him look shorter? Terry: Right. Ian Fleming initially disliked the casting of Connery as Bond in Dr. No, because he thought he's too tall and too dark for the role. Later, when he saw Connery's portrayal, he changed his mind and grew to like his Bond persona despite the apparent difference between the literary and the film character's physical appearance. After Connery's success, the filmmakers opted to cast actors of similar height and appearance until Daniel Craig came along and they kinda returned to the original character in the novels. I think, he's completely honest with the statement "6'2 on a good day". Definitely he was not above this in the morning (at his peak). Peak height: 6'1.25"/ 186 cm. Height nowadays: 6'0.5-.75"/ 184 cm range. Rob, is it possible you temporarily had Pierce at 6ft2 back in 05'? He was at 6ft 1.5 for a while, but I believe he was first given 6ft 1 flat at least in late 2004. Pierce and Roger looked close in height. This picture is from 1995 when Goldeneye was premiered. Pierce has a slight advantage so I'd guess he was about 1/4 inch less of 6ft2. The real James Bond types are short!so to all the people commenting on here saying Daniel Craig is too short to be Bond are just uneducated. Back to Pierce Brosnan's height then, yes he is tall, about 187cm. Rob, how about tweaking this to 6ft1⅜? I need to be careful with the 1/8ths. I won't rule it out though. Probably has dipped to 184cm by 2018. But 187cm is arguable in prime. Rick- that could be why they chose Daniel Craig as bond. Also, we don't need to debate the ideal height for Bond actor... As the writer actually decided his measurements so we don't have to .... In the novel From Russia With Love he clearly describes Bond as 183cm and 76kg (whether that is in shoes or not, I don't know, so I suppose the least he could be is 5'11 / 75 kg.... and he is described as having a swimmers physique, though not in the same novel if I remember correctly. Editor Rob: 6ft when that novel was written is certainly like a solid 6ft 1 range man today in the UK. @Ramage seems different to most who would downgrade celebs - he wants them to be taller than they actually are! IMO Pierce would have written 6'2 in the directory is he was that or just below (187)... just seems strange that actors seem to grow an inch or two miraculously after becoming famous. No way was Connery 188 without shoes, he is never really a head taller than many of his female co-stars- and domino (in thunderbolt) who might be five-ten in heels, is nearly as tall as him! Women tend to tell the truth about their height more than men (because they aren't bothered) so it's often better to compare men with with known female celebs. Peak would have been not too far off 6'2. Current I would say a flat 6'1. Any height for 007 is fine as long as the actor's above average in height. I wouldn't call 6'0" too short for any action role. 6ft3 is fine but not over. Connery at a strong 6ft2 did not look gawky at all. He looked the most masculine. I think 6ft is to low for 007. I think the perfect Bond height is 6'1. 6'3 (legit 6'3) is too tall. Connery at 6'2 was even looking a bit gawky at times. I'd even go as far as agreeing with grizz that a strong 5'11 guy who is trim can pull it off. Daniel Craig must be 5'10 flat. His build is too muscular too. Not sure what was going through their head the day he was cast as Bond. I agree with Rory- 5'11-6'3 is the perfect range for playing Bond. Over 6'3 and you're entering the henchman territory,as someone mentioned (it's a common practice in the movies that the good guy is always shorter or weaker than the bad guy, some David and Goliath metaphor,I guess). And yes, Fleming's Bond is described as a 6footer,but bear in mind that the book was written in the 50s when UK's national average was 0.5-1in shorter than today. So,IMO, 6'0.5-6'1 is the perfect height to play Bond nowadays. No he claimed 6ft2 on a good day which to me implies 6ft1½ range peak and looking at Bond, pre-Bond it's plausible. Even in Remember Me just 7 years ago he looked a good inch taller than Robert Pattinson. He was always just 6'1 and even claimed , 6'0.5 now is correct but no lower. btw Bond in Fleming's novels is said to be 183cm, so 6'0 is really be the ideal height for Bond not 6'1-6'3 like many people think. Rob, what do you think his current height is? He looks to me like he is in the six-foot range. His arms look disproportionately long, which could indicate he has lost a lot of height. Editor Rob: he could be 6ft 0.5 at most now, he is starting to look like he has lost more than just a small fraction, but it's natural. For many men, that 60-65 range is where the body begins to suffer a little with disc changes/shrinkage. Rob how do you think is his son, Dylan now? Surely he can't be just 6'4 like google claims. Editor Rob: it's what is on his model agency, but then maybe he is worth a page now he has hit age 20...he does tower above Pierce, but then Pierce isn't really looking 6ft 1 range these days. I’d like more 6’1”-6’2”. 6’3” is pushing it. Dear Rob before I ask my question I want to tell you that I'm a big fan of yours.and I'm new at this site. rob this question may be off topic but only an height expert like you can ans this.my question is that a person only looks tall at a height of 6 feet 1.agreed by the majoroty .and when ever I see legit tall person and I ask him his height the claim is mostly 6 feet 1, and mostly everybody now days lie about their height.thus do you think the people who we think are genuinely tall are and I'm only talking about 6 feet 1 men.are one inch shorter then their real height making them 6 feet in reality . and thus making the traditional 6 feet mark tall or maybe it was always tall because all of the 6 feet people claiming 6 feet 1 and all the 5 10 and 511 claiming 6 feet and making that mark short thus do you think all the 6 foot people are genuinely tall and claim 6 feet 1 because of the 5 feet 11 men rob plz ans this question I need your opinion. And by the way I think rob has Pierce height bang on . Bond I think should really be minimum 5ft11 and maximum 6ft3 and age wise no younger than 35 and no older than 50. In that sense Brosnan and Dalton were the perfect age and heights as Bond. Rob i have seen all the bond films with Roger Moore recently and I must say pierce brosnan pales in comparison too Moore as 007. Connery and Moore were the best as bond but Daniel craig and Pierce are tedious. Editor Rob: I think having slightly different Bond's was good for the longevity. And it was also great that they put a 5ft 10ish guy in the role. Had zero effect on the box-office. Rob, do you think the 6'2" claim is with shoes on? Editor Rob: early morning type claim I think. I have seen Roger Federer more times and i`m 6 ft.1.5 and i was a this 0.5 in taller. I also have seen later the photos with Roger and Pierce standing on grass, not the best ground. But i think Roger is about 0.5 in taller then Pierce, and Roger is a 6ft 1in, so Pierce must be 6ft maybe out of bed in his youth a bit more, but never more than 6ft 0.25in. Peak 6' (183 cm) with the help of his hair. Today around 5'10 and a half (179 cm). Watching world is not enough right now and seriously 6'2 seems impossible too believe in that particular film. Unless of course they hired a tall cast? 6'1.5 minimum prime. Definitely always gave me a 6'2 impression. Between 186-187 was his peak, not more. Now maybe 184/185 cm barefoot. 186cm 70's > 90's peak. 184cm today. Listing seems accurate looked over 6 1 in 80s maybe very early 90s. By his bond days had already started shrinking, he looked tiny in the horrible 3rd. He often looks a weak to strong 6 foot now but he is getting up there. Remember 6ft1½ is usually rounded up to 187cm (it's really 186.7cm) so it's not a huge leap to give him it. That and still roughly 6ft1 today, not convinced he's 184cm range. Rob how tall would you say Pierce Brosnan wife Keeley Shaye Smith is she is listed at 5"8 by she looks taller! Editor Rob: between 5ft 7-8 is possible, but she might actually have lost half inch or so with weight gains. Strong 6'1 peak. Could look 6'2 too. Rob, is 6ft1½ peak still arguable for Pierce? Editor Rob: that's the most I think I'd probably argue for him. I think he is exactly exactly 6'1 nowdays, maybe nearly of the 6'2 mark when he was young. I bet you never saw a 6'4 guy then, because 6 foot near a 6'4 is towered, in the link you provide, brosnan is not much shorter, around 6cm. I suppose it's possible guys like Dalton and Brosnan might have rounded down in an attempt to avoid being typecast, they may have been trying to avoid going down an action hero type career so were trying to play their height down. Having said that you can't rule out the chance that actually were just 6ft1 range. I think tbf to Brosnan in some of those 90s pictures with Dalton and Moore he might have been stood on uneven ground. Yh those pictures from the 90s of Dalton,Moore and Brosnan are quite bizarre. Moore you'd have expected to have lost maybe 0.75 inch by then so he naturally would have looked around 184cm but Dalton looks 6ft2 and strangest of all Brosnan looks 6foot there, no more. Editor Rob: well ultimately both Dalton and Pierce were happy to put out 6ft 1 flat to casting agents in the 80's, Pierce came out with his 6ft 2 on a good day, much like Roger Moore's out of bed 6ft 2, although Moore actually put 6ft 2 in the casting directory. I suspect Connery once had a 6ft 3 listing associated with him, but I'm not 100% certain as I haven't found it. Needs a quarter inch upgrade for both peak and current. On Roger Moore's IMDb there are a load of pictures with Moore, Dalton & Brosnan side by side from numerous angles. Obviously Moore was getting on at that stage (late 90s) so had probably lost at least an inch... but both he and Brosnan are similarly shorter than Dalton, by a not un-noticeable amount... meaning Brosnan was the shortest bond before Craig going on what little evidence there is of them all together. Interesting Brett, similar to Jackman? I think he is still a strong 6'1 / 185 cm. Peak at 6'1, now about 6'0.25". Back in his prime (GoldenEye, James Bond days) no doubt 6'1". In GoldenEye he only looked near an inch taller if that than Famke Janssen. Definitely 6ft range now. My father met him 5 years ago in Hawaii. My old man is a weak 6ft and Pierce had about a quarter of an inch on him. He has that tall appearance about him as well so I'm not surprised people would think the lad is taller than he is. Never over 6', if that. For some reason he never looked tall to me. Years ago, I was surprised to hear he was this height. A solid 6' 2'' is definitely pushing it. His peak was 6'1. David Letterman edged him out a little in 1995. Strong 6'1 but not more. Now looks closer to 6'0.5. Maybe he was 187/188 cm in the morning is plausible but not nowadays. Today seems a strong 184-185 barefoot. 1.87 is too much in my opinion. Never looked so tall to me. 187cm isn't too much but 188cm might be pushing it though. No more than 1.86... and no less. Solid 1.86 at peak. 1.87 is too much honestly. No less than 6'1 peak. Based on all the ladies he is eye to eye with, I have to say six feet and yes I considered the ladies in heels. He still looks 6ft1 in recent photos. 6'0" at best...far too much shorter than John Cleese (by at least 4.5") to be 6'1". 6'1.5 glory days, 6'1 today. I'd be very surprised if he's as low as 6ft today. I wouldn't take anything that Charlie says seriously if I were you. He once guessed Howard Stern at 5'10"-5'11". You're right, Brosnan's still 6'0" at the very least, and more than likely 6'0.5" Peak was around 6'1" or 6'1.25" as listed. Pierce certainly didn't come across as a 6'0 man in The Lawnmower Man.The female actresses in the movie were close to his height. In the movie he is approached by his Beautiful Neighbour both standing on the front lawn chatting. I was surprised how close in height Pierced looked towards the actress. I would say 1 inch height difference. I never believed Pierce to be 6'0 tall ever. He always came across as a 5'9 guy to me. Today he might be 5'8. I don't know if they're standing or walking in the 2nd and 3rd pic. I think standing, but in the first pic, you see Brosnan with perfect posture looks barely taller. Roger Moore didn't strike me as someone who kept his peak height a long time either. If anything, this has made me much less skeptical about Moore's height. Definitely a chance Roger was exactly as tall as he claimed to be. 6'1.5" peak and 6'2" in the morning. His low was probably 186 cm, so it's not a surprise he could look it. I think giving Brosnan 187cm peak is more feasible than downgrading Moore's peak to 186cm. yeah thety where pretty close in height but i think it genereally looked like rooger moore was 186,0 guy while brosnan many times look like he was 186,5 peak. In The Saint Moore could look near 6ft2...as could Brosnan in Remington Steele. I think a 60's Moore and and an 80's Brosnan were similar. rob do you really think roger moore was taller than him? i think you should atleast give both 186 peak ore even give pierce littel upgrade in peak. there is no way moore was taller. Editor Rob: both could be argued to be the same. 182cm is ludicrous. You could really argue I think somewhere between 6ft 1 to 6ft 1.5 at peak. Can't see him over 187cm and can't see him under 185cm. 6ft2 in the morning is believable but I highly doubt he was quite in the same ballpark as Ryan Reynolds, John Cusack or Hugh Jackman. I still stand by 6ft1½ though. And yes perhaps even the full 6'1.5 is actually imaginable for Brosnan but never would I guess him at a proper 6'2 188cm. He was probably 0.1-0.5mm taller than Moore when they were in their primes. If Moore is going to have 6ft 1.5 as his peak height then it's more than fair for Brosnan to get it as well, if not then downgrade Moore to 6ft 1.25 and keep Brosnan at this. I think 187cm peak is perfect, he could even look 188cm at times. He still looked 186cm up to just a few years. 182cm is a such joke, James. When did he ever look that short? Rampage- when I say he looked 5'11.5-6'1.25 It means that 182cm is the lowest I would imagine pierce being. And sorry but I could never imagine Pierce being as tall as 188cm. When I picture pierce brosnan I can imagine him being in the 5'11.5-6'1.25 range but 6'1.5 just seems like slightly too much for him. Rampage- personally I think 186cm peak is perfect for brosnan. Like its hard for me to picture clint Eastwood ever being the full 193cm peak likewise it's not easy to picture a legit 187cm peak for pierce. I agree with you on that to a degree but I think pierce always looked more than 5'11 to me in his films. Certainly he looks like a man who is over average height but clearly at the same not a VERY tall guy. woooouwwh the average guess think he was even over 6 1 1/2. i think that could be close maybe little under. a 186,6 guy at peak maybe? and today 186 but ould look shorter because different posture. @James B: anyone can get cancer tho. Suzanne sommers gad it of course female but still. Or anything else. Look at Michael j fox he's short and has parkinsons. Not disagreeing but saying it can happen at any height none is exempt. Now I have said that no height so superior but I'd rather be 6'4 like I am than 5'6" I will say that because I'm accustomed to it already but would take 5'6" over being 6'8" or 6'9" unless I were meant to be a pro athlete. Head length Rob? What would you say? Canson again you misinterpret what I said. I don't want to be taller I'm content with how tall I currently am,but if I were to choose between shrinking and growing I would choose to be taller is all. Canson-if you google male celebs who have died from cancer all of them are over 5ft6. @James B: no height to me is superior to another. If Insomniak at 6'5" wants to be taller that's cool but I was saying that when you are a height already like 6'5" that is less problematic than 6'8" I made that in reference to the statement he would rather be 3" taller than 3" shorter. I don't think either is "superior" really but for me I'd go with the least problematic and the better quality of life like not having to slouch under every doorway. As for cancer I don't think your risk is really any lower at 5'6" than it'd be at 6'0". You could even argue a case that being 5'6 is better than being 5'10 because you have a lower risk of getting certain illnesses like cancer the shorter you are. Well James to be fair I don't think it's howard sterns height that makes him visually unappealing.But I guess you do have a point that tall heights may not look good when you're gangly,but once you start putting on muscle I think you can pull off any height. I think very tall guys should probably aim to pack on muscle because they can always pull of that look well. Shorter guys can't pull of that look well because it makes them look short and square. Anyway I still think the Broz is around 185-186cm today, not as low as 184cm. In his prime 186-187cm which in feet should really qualify more as 6ft1½ than 6ft1¼. Few nights ago met this guy who claimed to be "6ft5" and even with poor posture he looked towering and very tall. Infact looked taller than guys I have bumped into who would claim to be 6ft6 so I have no doubts he was nothing less than an honest 6'5. It goes to show why many people have no idea just how towering a true 6ft6 looks like because 6ft4 range guys often claim it. @The Don: that comment doesn't make any sense at all. And if you see what Arch said as well as James B you see it is. I guess whatever floats your boat but why would someone want to be a height where they are close to hitting their heads on doorways or having to duck under them. That seems odd to me but hey we are all different. But don't call the comment BS just because you don't agree with it. Being tall does not suit everyone. It all depends how well you can pull it off because not every tall man looks like Rock Hudson or Pierce Brosnan do they? You get lots of tall guys who are more like herward stern or Brosnans son 'awkward' and gangly basically. I think Clint Walker is really the only guy who didn't really feel awkward with his height. He had a confident stride that at times could come off as a bit arrogant but at least he didn't try to hide it like others. Anything over 6'5 is too tall IMO. A legit 6'6 like Clint Walker looks massive, a big body to carry around. I think a guy like Manganiello or Rock Hudson can look very good at 195 ish but it's still a big height and a bit too big to be ideal. I was watching a film yesterday and Chuck Connors at probably 6'5.75 looked quite awkward in a lot of scenes standing. That could never be an ideal height. Arch- but still you would not want to be 6'4.75 would you? I think your height of 6'1.5 is much better than 6'5. So arch if you were given the option to be rather 6'6 or 5'4,which would you choose. I agree with the Don their are 7 footers who are happy with their height.You're acting like I'm a giant and moron for choosing to rather be taller than short and I live in the west and the Don makes a valid point,most people would rather be taller than shorter and anyone who says otherwise is probably lying. What a load of BS Canson, there is no such thing as being "too tall" as a man, especially in Western countries. Canson I think you're trying to project your own personal feelings onto me.Its like I said I already instinctively duck already when outside to avoid branches or indoors to avoid hitting low doors or low hanging lights or anything of the sort and no I'm not joking on wanting to be taller I love towering over people and I get height conscience when I see someone my height,taller or even a little close so If I were to be 2 inches or even an inch taller that would greatly diminish the amount of people near my height that I see on a daily basis.And I use public transport abd I can assure you that you're overestimating a 6'4 guy it's not that tall you would only reach the middle of my forehead and your only 2 inches taller than 6'2 which isn't that tall look at Stephen curry he looks miniature. I will say though that I think it's silly for a 6ft2 guy to want to be taller like 6ft7. Yes I agree with what you said. Also I have been meaning to ask you for a while, how tall are you? You are only a little bit short. I have heard some reports which say it is worse for your health to be tall and others which say it is better to be tall, I don't know what to think. @JamesB; I know you aren't like that so don't take that comments that was said too harshly. @Insomniak: you're joking when you say you want to be taller right? And at 6'5" in the states you'd rarely be ducking even in shoes. this made me think about being a 6ft 4-5 guy in UK homes - I'd tire quickly of having to duck under all the 6ft 5-6 door frames. Sorry I did not mean to offend people on here, I guess I was asking to be called jealous and bitter because of my below average height. And yes I will admit i am a short man at 5ft7. Canson I'm not lying theirs a bunch of threads on the subreddit tall asking them if they'd rather grow more or shrink more and most of them answered that they'd rather grow more.And personally I'd agree I wouldn't mind being a bit taller it's kind of like being a mini celeb with girls.I'm shocked you wouldn't want to grow taller and I'm already used to ducking under doorways even though I have like an inch or two of space so I wouldn't mind being taller I hate how guys on this website ostracize tall guys just cause their short and jealous.*cough*James. Well Arch my grandmother was only 5ft-5ft2 and she died of breast cancer 20 years ago. So yeah I guess short people can get cancer but perhaps it's different for short women compared to short men? My grandfather and great uncle on my dads side both died of prostate cancer in there late 60s (they were both 5ft10 I think). My great great grandad lived to his 90s and was only 5ft4 range and he smoked a lot in his life also he was very overweight at 210 pounds but it just goes to show that height can be a contributing factor to cancer. James no offence, but the human body is extremely complex, getting cancer is a lot more complex than just being tall and having more cells, otherwise guys in 5 ft 2-7 range wouldn't get cancer much. I believe that an excellent diet and regular exercise and not smoking/drinking much can go a long way to prevent cancer, even in very tall men. Certainly vegetables and fruits have some very powerful chemicals which have been proven to fight cancer or prevent it. But it's really complex. I think a very tall man is more at risk of heart disease/cancer if he is overweight. I know a friend of the family who is only in his 40s and might potentially have terminal bowl cancer. the guy I know used to be 6ft1, never smoked or drinked in his entire life, was not particurley overweight at 196-210 pounds and did lots of exercise. It goes to show that even being healthy some things associated with being tall are unavoidable. The human body is meant to be between 5-6ft not 6ft-7ft. If your in the 5ft-6ft height range the closer you get to 6feet the more height related problems you might encounter. I think 5ft8 is when issues with height related cancer increase compared to 5ft4, 5ft6 or 5ft7 guys. I think the 5ft4-5ft7 range for health/longetiviy reasons is an optimal height to be for a man. Just look at al Pacino he's in his 70s smoked all his life and has lost hardly anything compared to say Michael Douglas who was 5ft9.5, smoked a lot in his life and at age 72 is already minimum 2 inches shorter than he was in his prime. i love my height at littel over 6 foot5. i think short guys think it is scary tall but when you are that height you really like it. i mean most guys i know that are around 190 always cliam taller like 192. they want to be taller. i tihnk its when people get ovetr 2 meter it start to get to tall. but it depends on your proportions. @Insomniak: well to a degree. 6'6" is too tall imho if you're talking without shoes on and at your lowest. I'd throw 6'5.5 really as too much but it's right at the cusp of where anyone would want to be at their lowest if they don't use their height to play pro ball. I say this because 6'5.5/6'6 makes you 6'7 in shoes. That's too tall. Not good height imho as doorways are 6'7 or 6'8" typically. A full 6'5/6'5.25 is really where it ends to me. There you're 6'6" in shoes which is manageable. That's very tall but manageable. I only know because I have a solid 6'6 and a 6'7" friend who tell me all the time and I watch them walk around slouching and ducking and wearing flats. Me personally, I'd stay 6'4-6'4.5. if I were given a choice of being 6'1-6'1.5 or 6'7-6'7.5 I'd choose the former and be 3" shorter than I am now. The only thing I'd take higher is 6'5" flat because I am 195.8cm out of bed so I know how it feels and it isn't terrible. Of course I'm under a full 6'5" after maybe a few minutes. But i disagree with you. There aren't a lot of guys at that size of 6'4-6'6 that want to be taller. Now you get 6'4 guys who want 6'5" all the time but not 6'5" wanting to be taller. Most of them say they like being 6'5" but No more. Canson I think what you mean is that 6'5 or 6'6 isn't a bad height but you just might have some inconvenience in everyday life which I agree with you on, like I can't fit in my bed or my shower head is too small or the fact that I have a 36 inseam with a 30 waist so jeans that fit are hard to find.but if I were given the option to grow 3 inches or shrink 3 inches,I would always choose to be taller.Alot of tall people feel the same as me on tall reddit most of them believe we already have everyday problems so why not be taller. @Willes: i disagree slightly. 6'4" isn't bad height but I agree 6'6 is pushing it yes because you're 6'7 with shoes on in most cases. 6'5" is tall if it's a low because you're 6'6" in shoes but it is manageable height overall and no diff than 6'4 in some aspects (I'm a small hair over 6'5 out of bed) but 6'4 1/3 at night on an ordinary day. since doorways are usually 6'7-6'8 in the US some now in newer houses are even 6'9". His son is very tall, everything over 6'3 is too tall, but 6'6 is a different league. My parents are similarly tall (dad 6'1,mom 5'9) and I too turned out 6ft. All men in my family are 6' or over, I guess genetics sometimes play the role to make progeny from tall families closer to average (same as progeny from short family to make it above average). I wouldn't want to look like his son James. Very strange looking lad. Well that's what can happen if you get too tall. They're both normal tall range, James. Pierce was 6ft1½ peak and the wife looks to be at least 5ft8. I'm shocked his oldest son Sean isn't much taller. He's not even 6ft. Cassandra Harris was also 5ft8-9. He should have ended up 6ft2-3 range at least if not closer to 6ft4! His 6ft6 son is not standing at his tallest on purpouse. Suprising he grew so big given neither of his parents are exceptionally tall. Exceptionally tall starts at a strong 6ft3 and pierce obviously was never that. Feel bad for him though because being 6ft6 must be tough. i thought connery, brosnan and moore was all good as bond. i dint like the other that mutch. well daniel craig is pretty good to but the other 3 was better. 1; pierce brosnan ( maybe because i am born 91 makes me like him best) 2 , COnnery , 3 Roger moore ore daniel craig) about the same. and the other was pretty bad. Sub-6ft1 is too low, 6ft3+ is too high. Connery, Brosnan then either a toss up between Moore and Dalton. #3 Daniel Craig, although i didn't agree with him being casted as Bond based off of his height, he actually made up for it in other areas. Pierce looks a tad shorter than Jimmy Kimmel! Editor Rob: they look quite close there...whether Pierce is standing worse than Jimmy though? @Rob, we have an event photo now with Pierce and his sons. Click Here He's not even standing his best and Dylan towers Pierce. He has to be 6'6 now don't you think? The younger son now looks about 6 ft and still growing! Editor Rob: he can look near to 6ft 6 there. once again mister _lennon you´re absololute right on the estimates. brosnan barely 187 and moore 186. Just to put out something the current listing is to low because he was moore than 1 inch taller than robert pattionson who is listed at 184 and that was about 3 years back ore something?. if pattinson was 184 then brosnan looked 187 even now. althoug i think pattisnon is shorter and maybe is barely 183 and borosnan is barely 186 today.he hast shrunk more than about 7 mm is my guess. 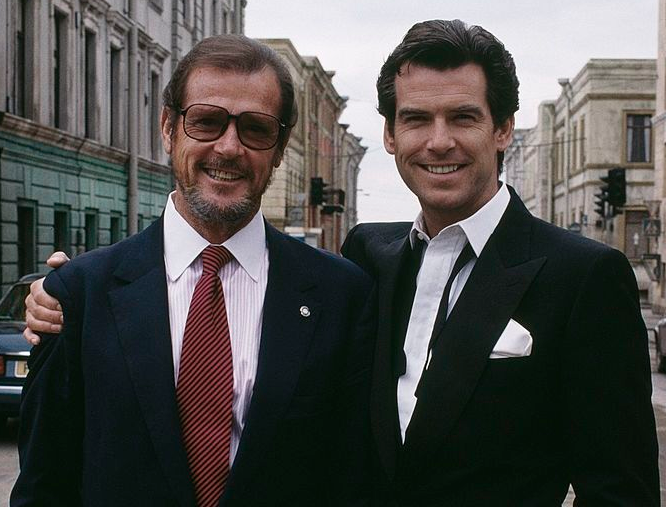 I think brosnan was taller. Rob, who would be taller in their prime, Brosnan or Moore? seems like most people think the same as me that he was close to 187 peak.